These conventions are most likely to be used in series titles. 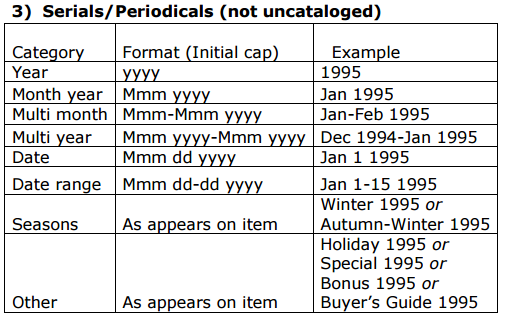 Please consult these examples for what the item record call number fields should look like. It is best to ask you system trainers if you don’t see and example that works for the item in hand. Uniform data entry is necessary to allow volume specific requests in the Public Access Catalog. • Volumes should be used to differentiate items with different content on the same MARC record. • Volume information should NOT be added if the MARC record is unique to that title and edition unless it can be further subdivided (e.g., into single discs) e.g., do not add for Yu-Gi-Oh! vol 1, Millennium puzzle. • Improper uses of the volume field include: shelving location (use shelf location or call number suffix); copy information (use copy field); call number suffix; and recording of author or title for uncataloged material. Do not use volume field for notes; use Free text block to alert circulation staff at check out or check in (e.g. includes booklet). 1) Uncataloged: Do not use the volume field for call number, author or title of uncataloged material; use it for volume information only. • Use the designation that appears on the item(s): book, part, disc, etc. • If both edition and year appear on the item, place the most prominent one first in the volume field, with the second designation optional. • Leave a space between each part of the entry.